Composite pallet and technology platform provider wins contract from Trillium Farms, AFGC CHEP Retail Index shows continued retail improvement. Year-on-year retail sales growth continued upward in the March quarter with a rise of 5.8 percent, with further strengthening anticipated, according to the AFGC CHEP Retail Index Edition April 2014. The Index also tracked 5.8 per cent higher in March 2014 than in March 2013 with a turnover over of $23.01 billion. Growth in the Index is anticipated to lift further with an increase of 6.6 per cent over the 12 months to May 2014 when retail trade turnover is forecast to reach $23.62 billion. Year-on-year retail trade growth for the June quarter is also projected to be 6.6 per cent. Inspite of weak labour income growth and modest job growth, the Australian economy has been boosted by low interest rates and falls in the value of the Australian dollar. Latest retail data from the Australian Bureau of Statistics have confirmed that retail sales picked up strongly late last year with retailers benefiting from an extended period of low interest rates. 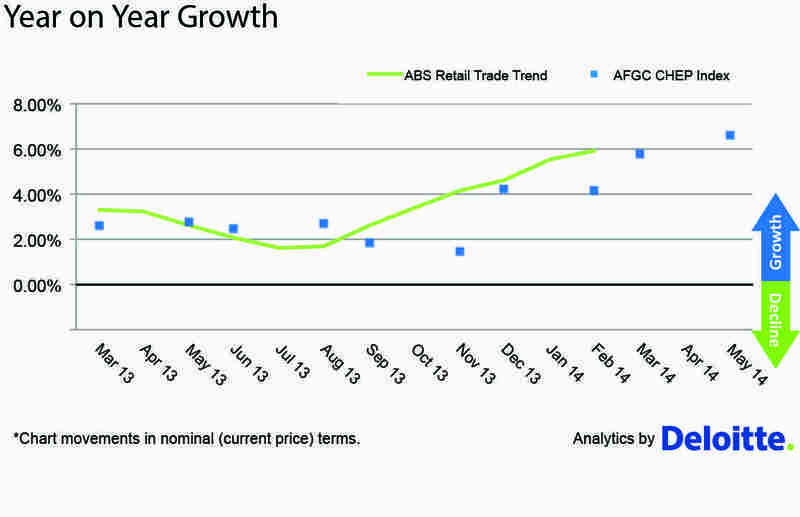 Indeed, retailers experienced an even better sales result in the year to December 2013 than forecast in Edition 12 of the AFGC CHEP Retail Index. “The continued strength in retailer sales over the past two quarterly results suggests a more stable and certain view of economic conditions,” adds Phillip Austin, President of CHEP Australia & New Zealand. “Expectations for the next quarter indicate a resilience in Australian retail supply chains and sales results.” The next AFGC CHEP Retail index will be released in late July 2014. Axios Mobile Assets Corporation has commenced a five year contract with the Trillium Farms, described at the Trillium website as one of the largest egg producers in Ohio. The agreement involves a phased roll out the Axios pallet and technology platform to the egg industry. According to Axios, the move comes with full endorsement of CCF Brands, one of the nation’s largest egg category buyers. The first logistics lanes between the Trillium facilities and their customers distribution centers have been identified by Axios, in collaboration with Trillium and CCF Brands. Additionally. all three parties have begun the data mapping process with Axios and their pallet pooling Division, Axios Logistics Solutions Inc., discussed further below. “Trillium believes that the benefits of the pallet and technology platform, such as FM Global 4996 certified, FDA material, USDA and phytosanitary compliant, track and trace, carbon offsets, operational savings, and asset efficiency will position us as leaders in the egg industry,” comments Doug Mack, Chief Operating Officer of Trillium. Axios recently formed Axios Logistics Solutions, a wholly owned subsidiary, to provide the pallet pooling and logistics services focusing on the supply chain at the retailer and vendor levels. “More and more clients are asking for a seamless integration of their pallet requirements into their operational, logistics and shipping processes,” states MacDonald.